Author of "Needle Felting - to the Point"
You're unique! Just like everyone else!! Gorgeous! About how long does it take you to felt something this size? Oh he's so sweet! I love his perch too, it's perfect for him! So sweet and pretty. You have some serious talent. This is so cute!! 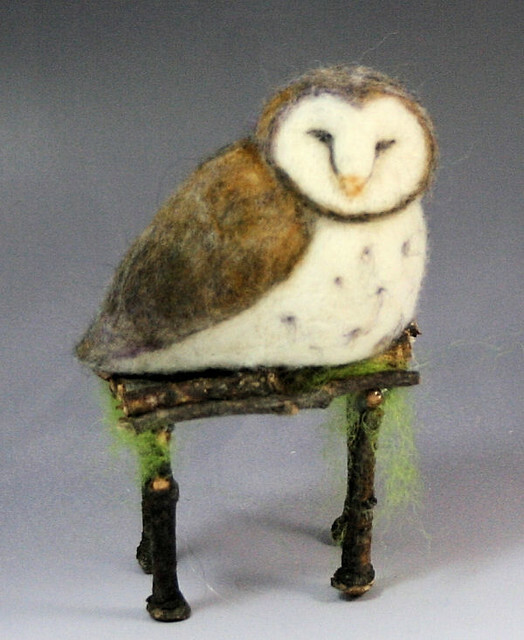 I just ran across a little felted barn owl on pinterest last night. That one didn't have this perfect little perch though!! I think I spent a couple hours making this guy. I'm in the process of making more and different types of owls - trying to figure out the best way to put them together so that the process is faster and easier to explain and do. As beautiful as your cats. Girl's hair be perfect for mah nest!